The world around you might be telling you to feel merry and bright, but you can just summon up much holiday cheer. That’s OK. It’s important to acknowledge your feelings and to recognize that you can’t make yourself feel happy just because the holidays have arrived. No matter what those Hallmark movies might tell us, the holidays are rarely perfect. It can be hard to hold onto traditions and nearly impossible to keep everyone happy. Be open to trying some new traditions. As the Mayo article suggests, if your adult children can’t make it over, find new ways to be together, such as sharing photos or videos. And if you feel isolated or lonely, look for community/social events to provide support and companionship. You can also consider volunteering your time to help others. Before you begin shopping – whether it’s for gifts or for holiday meals, map out how much you can afford to spend and stick to that budget. You can’t buy happiness. Mark off specific days for specific activities. One day can be for shopping, another for catching up with friends, another for decorating, etc. By having a concrete plan, you’ll avoid last-minute scrambling, which will make things feel less stressful. During the week between Christmas and New Year’s Day, it might seem like everyone you know is having some kind of party. And you feel obligated to attend all of them. Ignore that feeling. Trying to please everyone will leave you feeling overwhelmed. Your friends, relatives and co-workers will understand that you can’t be everywhere at once. Try not to let “It’s the holidays” act as an excuse to ignore healthy habits. When you overindulge, you’re giving yourself one more thing to feel stressed about. 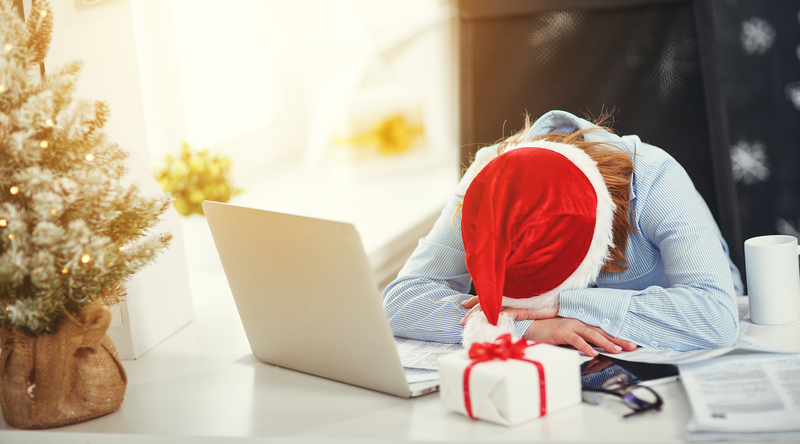 Get plenty of sleep, be sure to include physical activities in your daily routine and eat a healthy snack before holiday get-togethers so you’re less tempted to binge on rich foods. Find something to do each day that reduces stress, even if it’s just for a short period of time. It might be going for a quick walk, listening to music that relaxes you, reading a book or treating yourself to a holiday massage. Whatever the case, find something that takes you away from stressful distractions. If you still feel like you can’t manage your stress or depression, and unable to handle routine tasks, it might be time to talk with a doctor or mental health professional. How can a holiday massage help you manage stress? Don’t think of getting a massage as a simple luxury. It’s actually an effective stress-management tool. When we get a massage, our bodies unleash endorphins and dopamine, both of which make us feel better and calmer. If you or someone you know is feeling stressed out by the holidays, Body Restoration can help. Our Philadelphia spa offers massages, facials and other skin treatments, all designed to help you feel more relaxed so you can tackle – and hopefully enjoy – this time of year. Want to gift a holiday massage to someone special? Click here to purchase a gift certificate or click here to schedule an appointment.